the Magikarp Jump compendium by the players, for the players. We are currently maintaining 1,012 pages (275 articles). 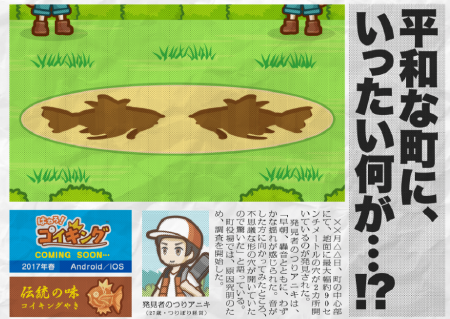 Magikarp Jump is a new game from Nintendo. What is this world coming to?! It's a Pokémon game all about the weakest Pokémon ever—Magikarp! Anyone can play this simple game in their spare time to create the most majestic Magikarp ever in this official Pokémon app! What kind of Pokémon is Magikarp? It's famous—for being pathetically weak, unreliable, and generally useless. It can't learn any powerful moves—all it does is flop around and splash! When it flops its way too high in the sky, it's sometimes snagged by the Bird Pokémon Pidgeotto—never to be seen again! Many surprising events lie in store for this pathetic Pokémon. But don't worry—it'll just keep on jumping until it can jump no more! What kind of game is this? Simple controls let anyone easily raise many generations of Magikarp. Tap the food that appears on the screen to feed your Magikarp, or have it complete training to increase its Jump Power! It's easy to do, and with each generation you raise, the next generation grows even faster! In this app, you can fish up all kinds of Magikarp with unusual patterns like calico and polka dots! When you encounter a rare Magikarp, show it off to your friends on your social media networks! A number of popular Pokémon can appear to help your Magikarp grow. Keep playing to find out which Pokémon you'll befriend! Spruce up your pond with Decorations! Spruce up the pond where you raise your Magikarp. You can make the pond of your dreams, and help your Magikarp grow faster, too! There's a ton of great content at the Gamepedia Help Wiki that can help you get started! Find out more about the wiki on the Community Portal page. If you need help, you can always ask the admins at the Admin noticeboard. An edit doesn't have to be massive; just fixing spelling errors and broken links is enough. This wiki is part of the Gamepedia Gacha Network. For more Gacha goodness, check out one of the wikis below! Discuss this navigation bar and suggest wikis to include here. This page was last edited on 10 July 2017, at 17:15.